Palms to Pines Gliding gets very, very high. Palms to Pines Gliding operates from the privately owned Bermuda Dunes Airport. At 10,000 feet, Chris Dabolt calmly turns the engine off. The propeller’s spin lulls to a complete stop. Cool, crisp air wafts through the clear cockpit canopy. It’s serene and beautiful. We are gliding. A minute ago we were sitting in a powered aircraft. Now that craft has become a glider. What an incredible way to view the Santa Rosa and San Jacinto mountains, the Coachella Valley, and, in the distance, the Salton Sea. Palms to Pines Gliding operates a unique airplane that takes off under its own power, then transforms to a glider at altitude. 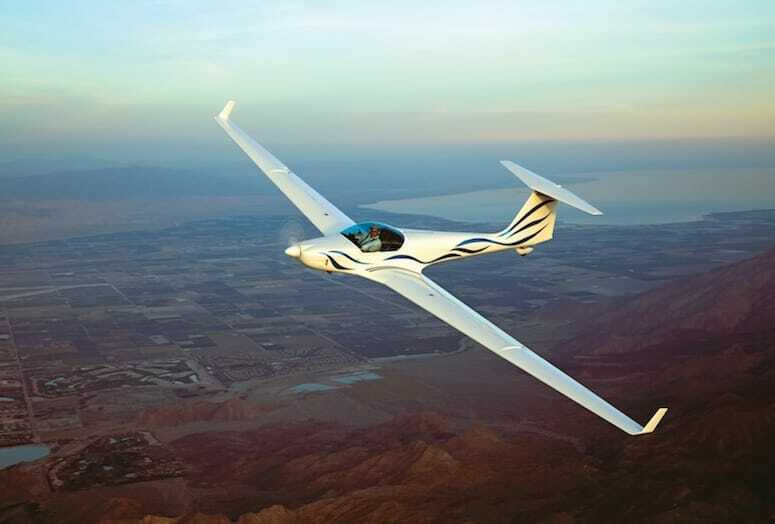 The advantages of a powered glider: It doesn’t require a tow to take off and can land safely at will at any airport. It’s truly a one-of-a-kind experience. “Once you’ve caught the thermal updrafts you soar with the eagles,” says Dabolt, the owner of Palms to Pines Gliding. He has been a glider pilot for nearly 35 years with commercial and flight-instructor ratings. VIDEO: Take a ride with Palms to Pines Glider owner Chris Dabolt. Passionate about gliding, he has accumulated more than 2,400 flight hours, has flown in numerous competitions, and holds several soaring records. His glider, the Aeromot AMT-200 Super Ximango, is a beauty to behold; its 58-foot wingspan and light weight afford a 31:1 glide ratio (which means for every foot of drop, the glider flies 31 feet forward) and in fact it’s the largest wingspan on the Bermuda Dunes Airport tarmac. The Ximango was designed by Frenchman René Fournier and built of fiberglass and carbon fiber in Brazil. It’s equipped with an economical and reliable 80-horsepower Rotax engine and was originally flown to the U.S. from Brazil by way of the Caribbean and Florida rather than being boxed and shipped. Gliders have the same basic controls and instruments as a Cessna and fly in much the same way. However, a Cessna can only glide about 9 feet forward for each foot of altitude lost and descends much too fast to take advantage of the rising air that gliders use to stay aloft for hours. The Ximango, on the other hand, glides farther and descends slower, making it very well suited to take advantage of the various kinds of rising air commonly found above the Coachella Valley. Palms to Pines Gliding operates from the privately owned Bermuda Dunes Airport. Dabolt selected the airport because of its large runway, friendly and helpful staff, and proximity to the local mountains and deserts, which provide both spectacular views and the ideal conditions for gliding. With the engine off, wind is the only sound amid the crystal-clear, azure sky. I can smell the fresh green grass as we soar over private golf courses and the scent of pine as we skim the mountaintops of Idyllwild. Soaring over the desert expanse, I’ve finally found cloud nine. There is truly nothing quite like gliding to lift your spirit and make it soar.